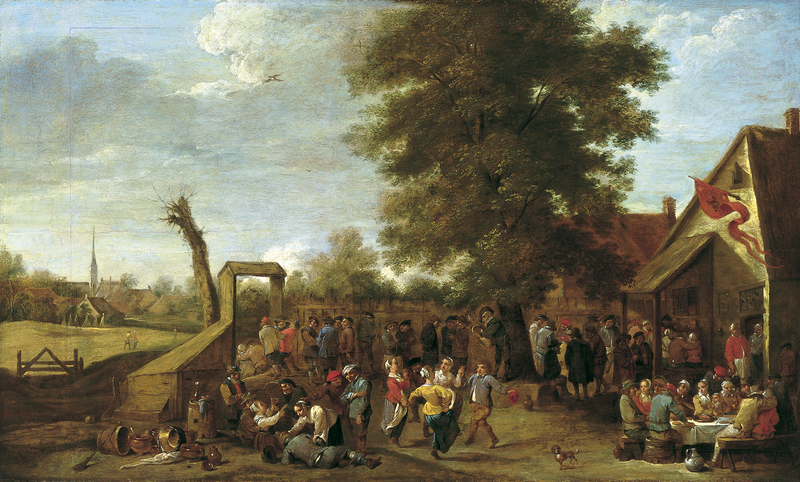 Among the subjects painted by David Teniers II, that of village festivals is one that appears regularly throughout his career and which he depicted in a distinctive and individual manner. These compositions depict villagers and peasants amusing themselves outdoors at the entrance to inns or taverns. Teniers used these occasions for depicting moments of leisure, when the two social classes joined forces for dancing, eating, drinking and relaxing. Such scenes offered the artist the opportunity to depict large numbers of figures with a wide range of poses and gestures. This is the case with the present oil in which, under the watchful eye of the innkeepers standing at the doorway, a tranquil group of figures is seated around a table. In addition, the group of dancers in the centre and the group of the left who start to show the results of excessive consumption of alcohol all provide further opportunities for depicting poses and movements. 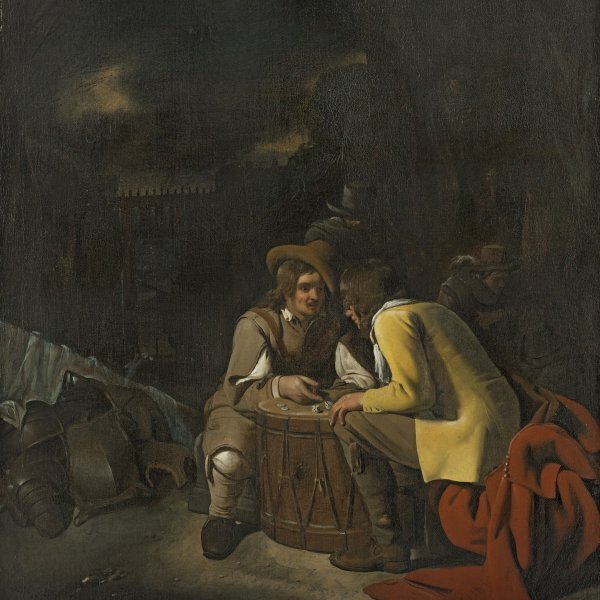 Teniers used the middle-ground of the painting for additional groups of figures seen in animated conversation. The panel was acquired for the Collection in 1928 as a work by David Teniers the Younger, from the Munich gallery E. A. Fleischmann’s Hof-Kunsthandlung. A few months before its acquisition Bode had stated that the painting was by David Teniers, an opinion shared by Hofstede de Groot. The painting was included in the Munich exhibition, when it came to the attention of a large number of art historians, having been previously little known. It appeared in the Collection’s catalogues of 1937 and 1958 with only brief entries. In 1969, however, Ebbinge-Wubben wrote an extensive entry on the panel. Another version of this painting is in the Bührle collection in Zurich. It reveals a number of small differences that affect the composition. The Zurich painting, which was formerly in the collection of Edmond de Rothschild, is signed and dated 1646. A copy on canvas and of slightly larger size attributed to a follower of the painter is known to have been in the Vieweg collection in Germany. Some of the figures, situations, gestures and combinations of figures in the present panel are also to be found in two other works by Teniers in The Hermitage, St. Petersburg, and the Kunsthistorisches Museum, Vienna. The latter collection has a scene similar to this one, with a group of dancing figures in the centre and a similar standing bagpipe player under a tree who provides the music for this gathering, as well as a table with various peasants seated around it that closes the composition on the right. The Vienna composition is, however, in reverse to the present one and has the additional element of a small group of elegantly dressed figures in one corner who take no part in the festival and who may be its patrons.